Content is a main part of a website that may consist of various elements, such as texts, images, sounds, videos, animations, and more. 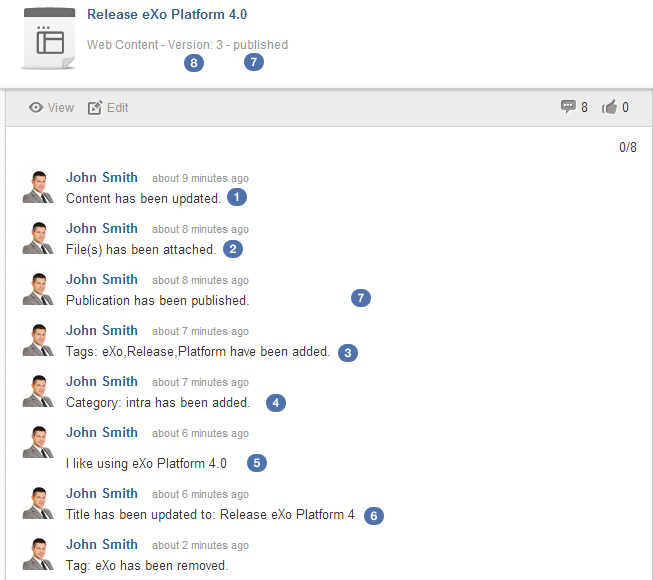 In eXo Platform, you can manage both structured and unstructured content. Main content contains all key content, such as texts, images, links, tables, and more. Illustration is an image which is used to clarify or explain the content. Also, a summary also can be added to this image. CSS Data are used to present the web content, such as layout, font, color, and more. JS Data are used to make web content more animating and dynamic. Introduction to the Edit mode, procedures to do actions in InContext Editing, Inline Editing, CKEditor and information about the publication process. Introduction to the publication process of content and how to manage the publication. Introduction to the Content By Query portlet and detailed steps to add this portlet to a specific page. Introduction to how to work with categories in Sites Explorer via the Add category and Manage Categories actions added to the Action bar. Steps to create content in a category. Information about Web content, and detailed steps to create, edit, delete, publish and search for web content via the Sites Management drive. Instructions on how to add multiple languages for content. Two ways to access a website using WebDAV, how to add/delete new web content in WebDAV. Introduction to the Fast Content Creator portlet, steps to configure this portlet and to create and view content with this portlet. Instructions on how to access and configure the Category Navigation portlet. Introduction to Search Engine Optimization (SEO), steps to manage SEO data of web pages, web content and optimize your website for search engine. Steps to search for content and to configure the Search portlet. Steps to print any content in a site. This function allows web-contributors to edit content, quickly access content list folders from the homepage of the current site, publish content without using the Manage Publication function in Sites Explorer. 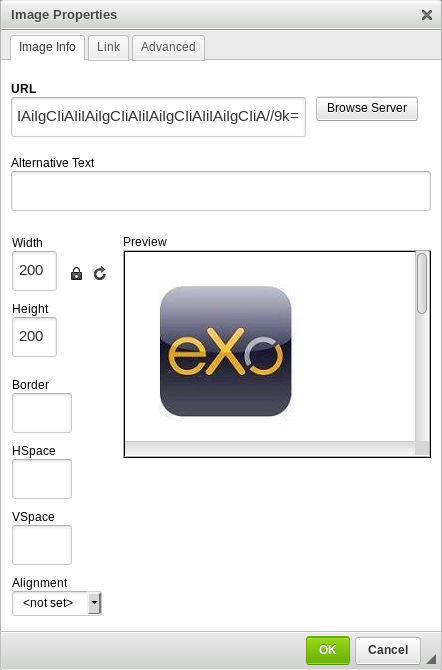 Edit mode Introduction to the Edit mode in eXo Platform, how to enable and use this mode. 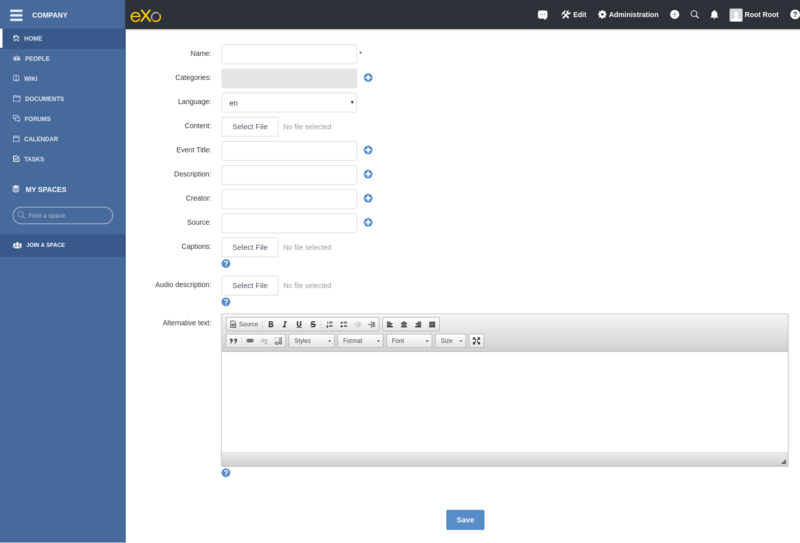 CKEditor Introduction to the additional features of CKEditor in eXo Platform. When you access the Agital site, by default, the site content is in the published mode and you cannot edit them. 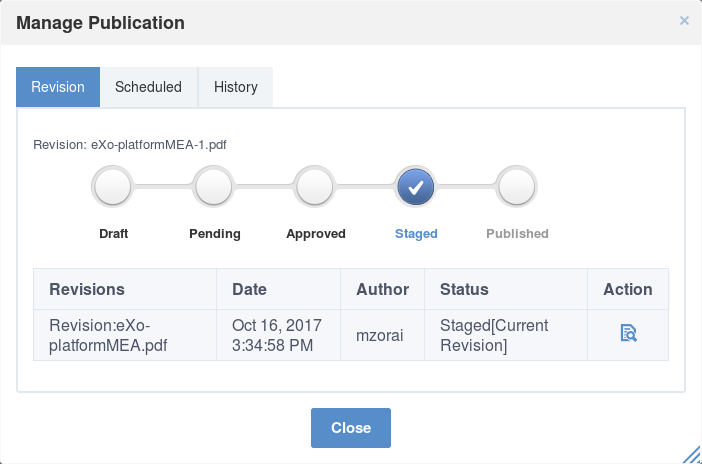 However, eXo Platform provides you with the Edit mode which enables you to edit all content of the Agital site by using the InContext Editing and Inline Editing features. When hovering your cursor over content, you can see which enables you to quickly edit this content in Sites Explorer. You can take advantage of this feature to submit content to a page. To turn on the Edit mode, click Edit on the top navigation bar, then select Content from the drop-down menu. For single content viewer (SCV), you can see the current state of the content, the Edit Content icon and Preferences icon. 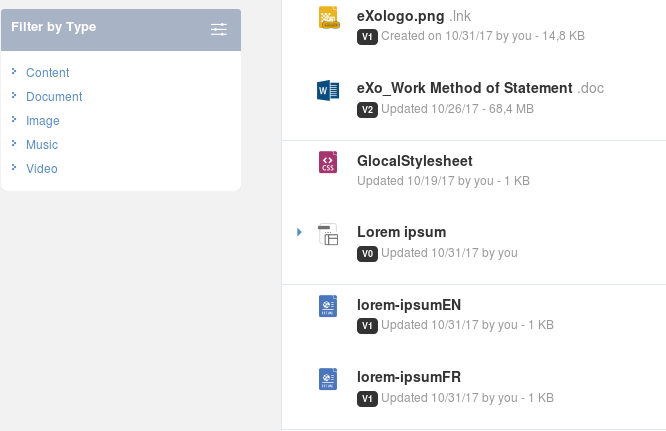 For content list viewer (CLV), you can see the current state of the content, the Edit Content icon, the Preferences icon, the Add Content icon and the Manage Content icon. By using the InContext Editing feature, the process of editing a page becomes more intuitive. This feature allows you to edit content “in context” without using the WYSIWYG editor, and the new content will automatically override the old one. To use InContext Editing, you first need to turn on the Edit Mode <TurningOnTheEditMode> . 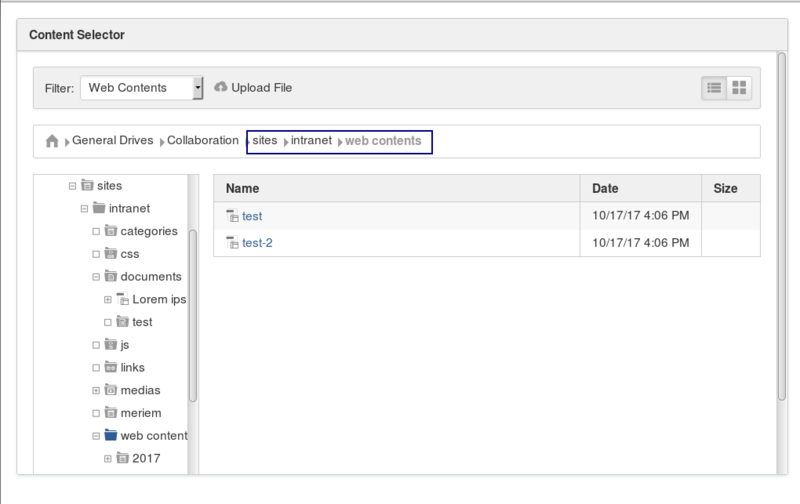 Adding new content by using InContext Editing is enabled for the content list viewer (CLV) only. 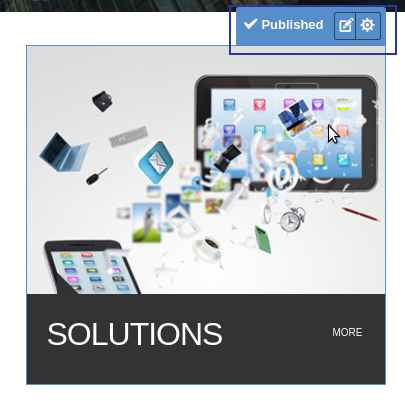 Turn on the Edit Mode, then hover your cursor over the CLV to which you want to add new content. You will be redirected to the Sites Explorer in the creation form of the content having the same type as other contents in the CLV. Close Closes the content creation form without saving the content. Save and Close Saves the changes done and closes the creation form. Save Saves the changes done without closing the creation form. Fill all the fields in the form. The field name is required. 4.Click Save or Save & Close to save the content. After closing the content form, you can view the content and do some actions listed on the Action bar for the content. See the Working with basic actions for more details. The folder, where a document is saved, is the path you have selected in the Managing preferences section. You can edit any content on the homepage for SCV and CLV with InContext Editing. Turn on the Edit Mode, then hover your cursor over the content you want to edit, and click at the right corner. You will be directed to Sites Explorer with the document form for you to edit. Make changes on the content, then click Save or Save & Close to accept your changes. After closing the Edit form, the content is in the Document View. Click to return to the site. In the Edit mode, your new content will be in the “Draft” state with its visible modifications. Click to publish your edited content. Your content is now in the “Published” state. You cannot see the edited content in the draft state when you turn off the Edit mode. With InContext Editing, you can easily manage a content list viewer on the page. 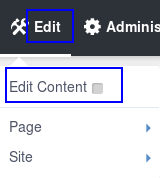 You can add new content, edit, delete an existing content or copy/cut/paste in the CLV and take more actions in the right-click menu. Turn on the Edit Mode. Hover your cursor over the CLV to which you want to add new content on the homepage, and clicck . You will be directed to the Sites Explorer page. Select on the Action bar. Do the same steps as in the Adding Content section. You can do many different actions for specific content in the CLV. See the Working with basic actions section. Preferences enable you to edit content in the single content viewer (SCV) and the content list viewer (CLV), reset the display of the content in SCV and CLV and publish content. Hover your cursor over a single content viewer and select of a single content viewer. The Content Detail Preferences dialog appears. The Content Selection tab Content Path: Select the path of the content that you want to show. Configure the visibility of Title, Date and Option Bar. Show Title: Select this checkbox to display the title of the content. Show Date: Select this checkbox to display the date of the content publication. Show Option Bar: Select this checkbox to display the Option bar which is used to show the print link. Show in Page: The content is shown in the page. with: Parameters contain the content path. 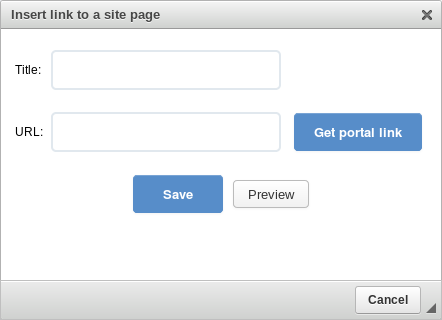 Dynamic Navigation: Allow you to get a parameter to configure the portlet by URL. It means that the URL containing the content path can be dynamically changed. Disable: The single content will be opened by an URL containing the Content Path. Enable: This portlet is configured with the provided parameter (“content-id” by default) and the content. Content Visibility: Allow you to use a cache shared between users to get content. If you want to get content, which are displayed in CLV or SCV, from one cache, select Restricted by Authentication. If not, select Restricted by User Roles. In most cases, you should not switch to Restricted by User Roles as it reduces the overall performance. Hover your cursor over to see a quick help for each section. Click next to the Content Path to select another content. The Select Content dialog appears. Select a folder in the left pane, and its content in the right pane. The selected content will be displayed in the Content Path field. Tick the checkboxes, including Show Title, Show Date and Show Option Bar, if you want to display the content title, the publication date and the print button like the illustration below. i. In the Print Setting part, click to open the UIPageSelector dialog. ii. Click , then click a folder on the left and select a page which will show the content on the right by clicking . Click Save to save all your changes. Turn on the Edit Mode, then hover your cursor over a content list viewer and select . The Content List Preferences dialog appears. 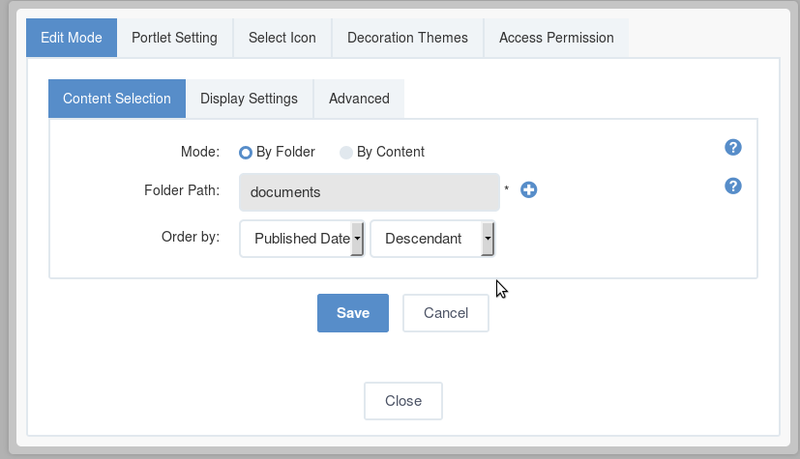 By Folder: Allows selecting a content folder in the Folder Path field. 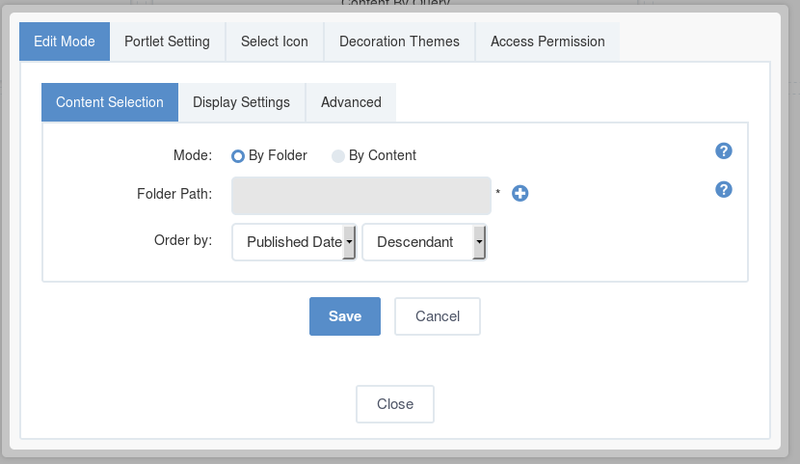 By Content: Allows selecting by the content in a specific folder in Folder Path field. Folder Path: The path to a location of a folder that contains the content. Order by: Sorts content in the List Viewer by Title, Created Date, Modified Date, Published Date, Event Date, or Index in the ascending or descending order. Header: The title of all content that is shown on the top of the content list viewer. Automatic Detection: Ticks this checkbox to enable automatically detecting the header of the content list viewer basing on the current selection. Template: The template which is used to view the content list. Paginator: The template which is used to view each content in the list. Items per Page: The number of items which will be displayed per page. The following options which can be shown or hidden by ticking or unticking checkboxes respectively. Show Title: Title of each published web content/document. Show Header: Header of each published web content/document. Show Refresh: The Refresh button at the left bottom of the page. Show Image: The illustration of each published web content/document. Show Date: The created date of each published web content/document. Show More Links: The Read more link to read all the content of web content and/or document. Show Summary: The summary of each web content/document. Show Link: The link of web content/document. Show RSS Link: The RSS link of all content of web content/document. Enable: This portlet is configured with the provided parameter (content-id by default). By: This parameter is the key in the URL to let CLV know which really is the path in the current URL. Show in Page: The single content in CLV will be shown in a selected page. You can select any page but should take one with a Content Detail Portlet. The “Dynamic Navigation” is enabled in the Content Detail Portlet that interprets the URL and shows a single content. With: This parameter is the key in the URL to let SCV know which really is the path in the current URL. Content Visibility: Allows using a cache shared between users to get content. If you want to get content which is displayed in CLV or SCV from one cache, select Restricted by Authentication (default). If not, select Restricted by User Roles. In most cases, you should not switch to Restricted by User Roles as it reduces the overall performance. 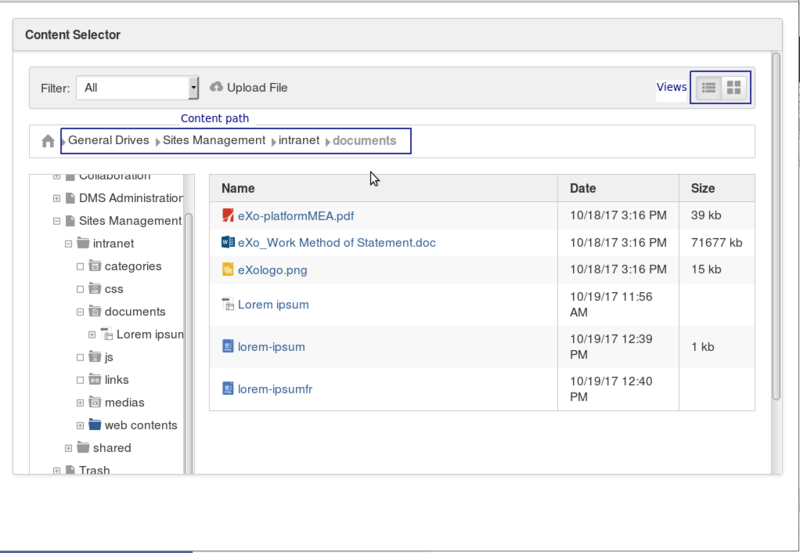 Select content you want to show on the content list viewer by clicking next to the Folder Path field. 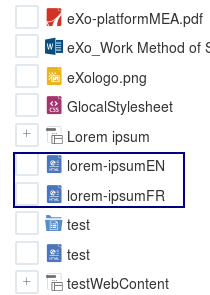 If you select the By Folder mode, select an available site on the left, then select a folder that contains content (documents and/or web content) on the right by clicking the folder. If you select the By Content mode, select an available folder from the left pane, all content in this folder will be listed in the right pane. Click content on the right that you want to add to the content list. There will be a message, informing that you have successfully added it to the Content List. The selected content will be listed in the Content List. Click the Order by field and select one criterion to sort the content list in the ascending or descending order. Enter a header for the content list in the Header field if you want. Select a template to display the content list in the template list. Select the Advanced tab to activate the dynamic navigation and select the content visibility. The Inline Editing mode allows you to edit directly on the page without going to a separate one. By using this mode, you can edit the text in the same location in such an intuitive and convenient manner. Turn on the Edit Mode, then hover your cursor over the area you want to edit. The editable area will be highlighted. Click the area you want to edit. Make changes on your selected area. Click to accept, or to discard changes. After you have made changes on your content, it is in the Draft state. Click to publish the content. Now, your edited content is in the Published state. Click to open the Insert link to a site page form. Enter the site title of the link in the Title field. Enter the site URL manually, or you can also click Get portal link to open a page containing all the sites in the same server, then select one that you want. Click Preview to view the site. Click Save to accept inserting the site to the document. Click to open a page. Click the plus before the document name, or click directly the document name in the left pane to show the content in the right pane, or click to upload a file from your local device. Click content that you want to insert to the document. Click to open the upload image form. Click on Browse server to open the WCM Content selector allowing to upload from desktop or to select an existing attached image. By default, the WCM content selector opens the folder where the webcontent/Illustrated webcontent will be saved. In this case, the webcontent is added under sites/intranet/web contents. If the WCM Content selector has already been opened and a file has been selected then this last location will be displayed. Go to file Explorer under /sites/intranet/web contents and create a new webcontent. Click to insert an image and then Browse server. 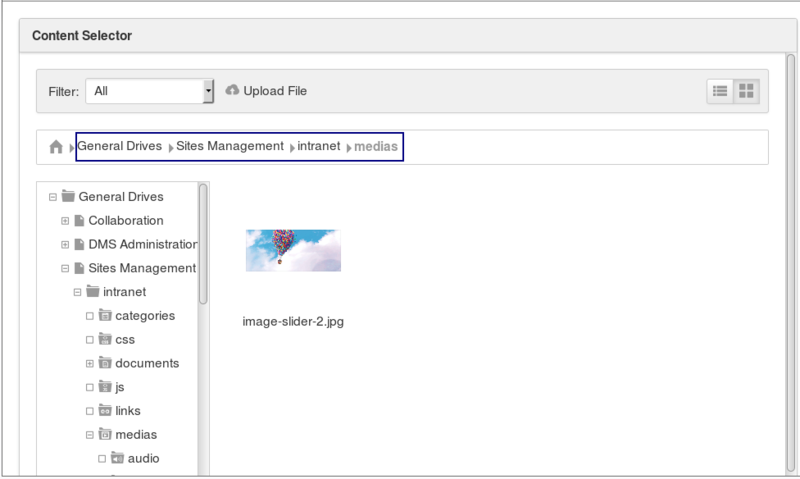 The WCM content selector opens the folder /sites/intranet/web contents (the first case). Browse to get, for example, under the path sites/intranet/medias, upload an image and insert it to the webcontent. 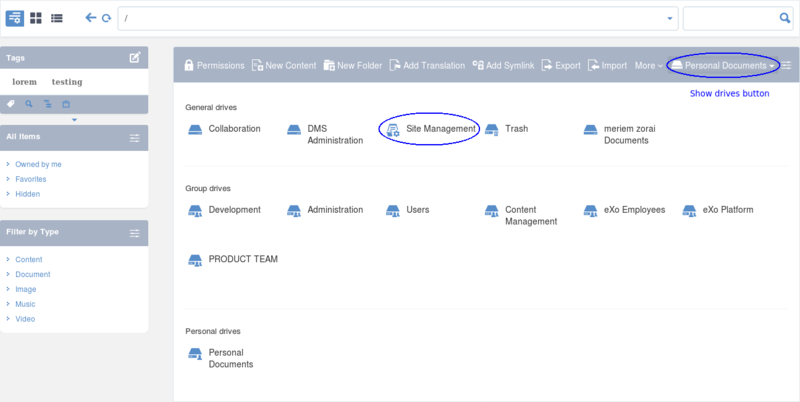 Reclick and then on Browse server, the WCM contents selector will open the last location which is sites/intranet/medias and not the default one /sites/intranet/web contents. Select an image from the existing ones or click on to upload an image from your desktop then select it. The image will be first previewed in the Image properties form. Click OK, the image will be inserted in the webcontent. To finalize the webcontent/illustrated webcontent creation, click on Save or Save and close. Request for Approval –> Approval –> Publish. If you want to publish your content without having the “Approve” or “Publish” right, you first need to send a request for approval by clicking on the Action bar. If you have the right to approve or publish content, you will see a list of content waiting for your approval at the bottom of the Sites Explorer. Click the content to review. Click on the Action bar to approve the content. If you have the right to publish content, you can publish it immediately without the Approval step. After being approved/published, the content is removed from the list of Waiting For My Approval at the bottom of the Sites Explorer. You can an quickly publish content by opening your desired content, then clicking . This function allows you to manage the content publication. You can publish or unpublish any content or publish the content in a given period. Also, you can review the publication history of the content. Select content (on the left or right pane) which you want to manage its publication. Click on the Action bar. The Manage Publication form appears. The Revision tab displays some basic information and the current state of the selected node. The icon allows you to view the content of the node. The icon allows you to restore a version of the node (refer to Activating document versioning for more details). 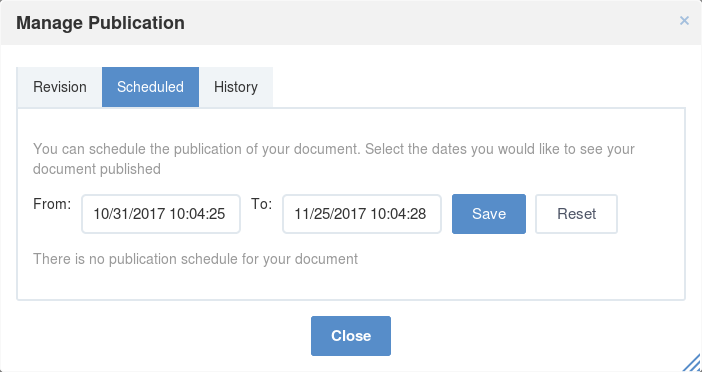 The Scheduled tab allows you to publish content in a period. The History tab allows you review the publication history of the content. Set the status for the content by ticking the corresponding checkbox in the Revision tab. Draft: The content is in draft. Pending: The content is waiting for approval to publish. Approved: The content is approved. Scheduled: The content is published in a period. When checking this checkbox, you will see the Scheduled tab. Select this tab, then click From/To to select the start and end dates for publication from a mini-calendar. Click Save to accept publishing the content as the schedule. To publish your content forever, you should not set time in the To field. Published: The content is published immediately and permanently. Click Close to quit the form. The Content By Query portlet allows you to collect and display data throughout a workspace by using a query instead of selecting items by a folder or by content. Drag and drop the Content By Query portlet from the Page Editor –> Applications –> Content to the main pane. This can be done while creating a new page or editing an existing page or editing the layout of a site. Edit the Content By Query portlet by hovering your cursor over it, then click to edit the portlet. The form with the Edit Mode tab appears. To know the details about the fields in this form, see here. In the Advanced tab, enter a valid query into the by query field to get data that you want to display. Select a workspace where you want to get data. Click Save to complete adding the Content By Query portlet. Click to quit the Page Editor page and see the displayed data. As a web-contributors, you can easily work with categories in Sites Explorer via the Add category and Manage Categories actions added to the Action bar. By default, these buttons are available in the Categories and Web views. To know which drives have these views, see here for more details. This function enables you to quickly create a new category in Sites Explorer. Select a folder in which you want to create a new category. Select on the Action bar to open the Add Category form. Click Save to accept creating the new category. You can assign available categories to content/document folders only. Select a content/document folder to which you want to assign a category. The Add Category form appears. Select the Select Category tab to show the available categories. Select a category tree for the content/folder. 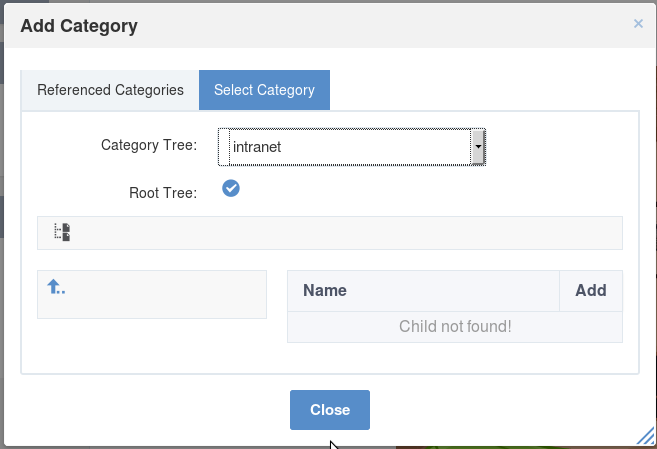 Click next to Root Tree to add the category tree to the content/folder. Or/And click a category on the left, then click corresponding to the child category on the right to add it to the content/folder. The categories added to the content/folder will be listed in the Referenced Categories tab. You can add many categories to content. Viewing a category allows you know which content is added to the category and you can view it by double-clicking its name or do many different actions in the right-click menu. Go to the drive which contains the category you have added. There will be a list of categories available. Select your desired category. The content added to that category will be listed. 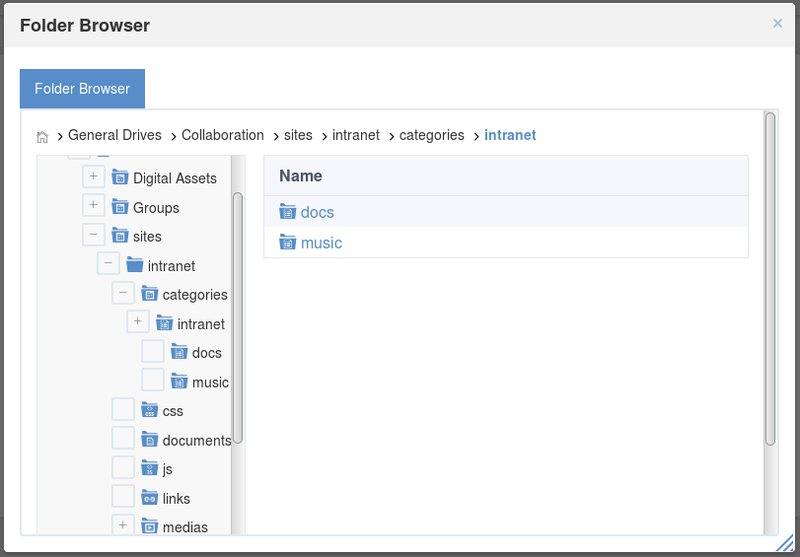 To know which drives contain categories, see Categories in Content Administration. When copying and pasting content in the category tree, a reference to the original content will be created. This reference is a symlink rather than a copy. This feature is used to preserve the disk space. Select content to which categories have been added. Select the Referenced Categories tab. Click that corresponds to the category you want to delete. 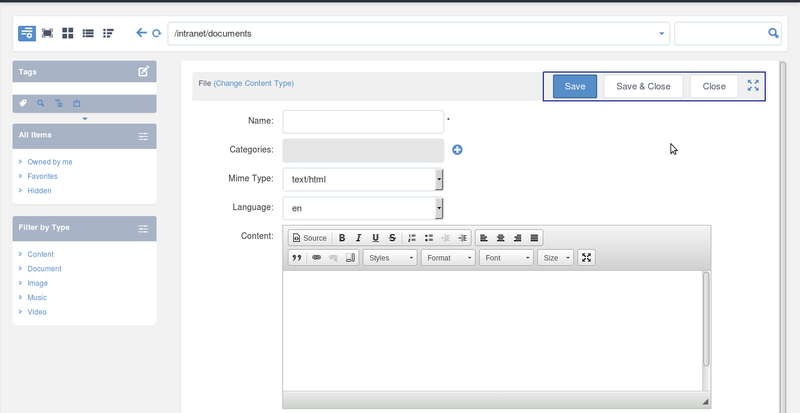 In eXo Platform, you can create new content in any folders or directly in a CLV with Incontext Editing. However, to facilitate the content management, categories which are usually used to sort and organize documents make your desired searches more quickly. Also, creating content inside a category helps you manage and publish them effectively. After creating a document, you should categorize it by adding it to a category. Otherwise, documents should be created right in a category and links to those documents will be automatically created in the category. 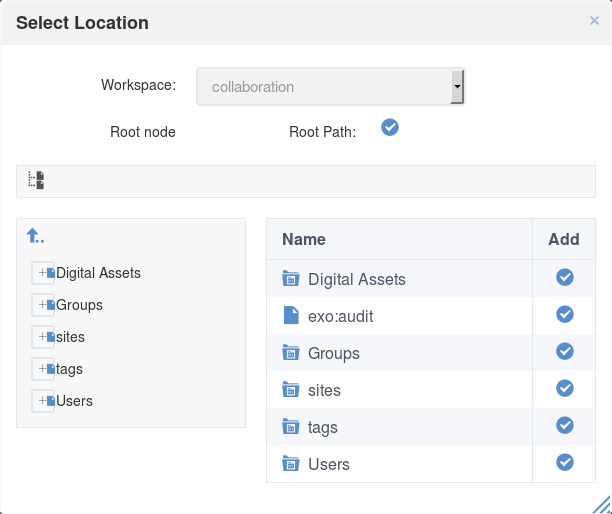 In eXo Platform, categories are stored in JCR. Click –> Content –> Sites Explorer on the top navigation bar. 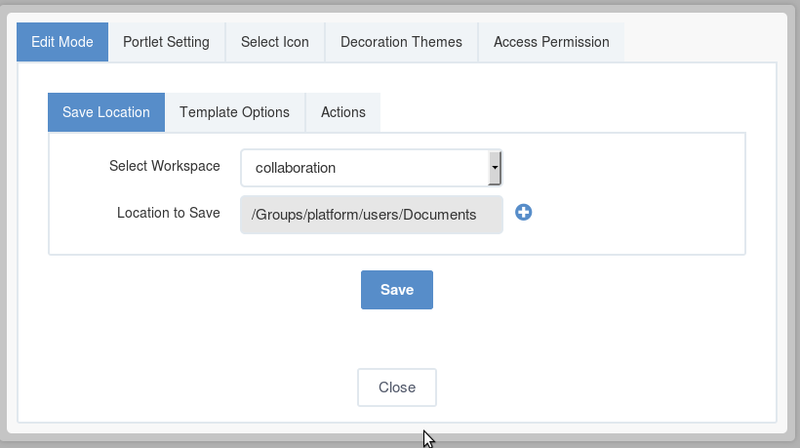 Open the drives list, and select a drive that has categories, for example, Collaboration. Select a category where you want to add new content. 4. Click on the Action bar to create the new content. See the Creating new web content section to know how to add new content. 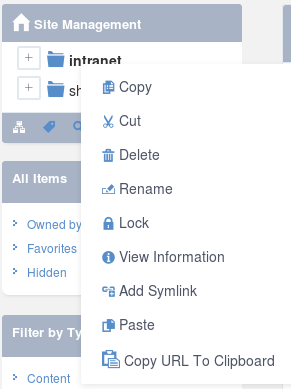 The new content is stored in the category as a symlink and also stored in also stored in another folder depending on the target path configured while creating a category tree by Administrator. To view the content, simply click the Symlink. Web content is a key resource which is used for a site. Other resources make a site more dynamic and animated by using layout, color, font, and more. This section focuses on how to manage web content in a specific site via the Sites Management drive which allows you to manage content of all sites in the portal. Instructions on how to create new web content in a specific site. Instructions on how to edit/publish/delete web content. Only users who have the right to access the Sites Management drive can do it. Go to the Sites Management drive, then select a site to which you want to add web content. Select the web content folder on the left. In this step, you also can add new web content into another folders (documents and media folders) of a site but you are recommended to select the web content folder because: - Managing web content of a site becomes more easily. - You do not have to select many web content types in the list of document types. It makes adding new web content more flexibly. Click on the Action bar to open a list of content templates, including Illustrated Web Content and Web content. 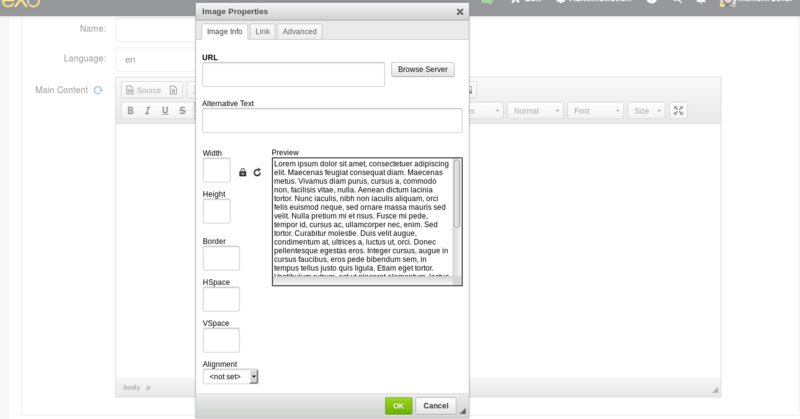 Select a template to present the web content by clicking one. Enter values in fields of the form. Click Save or Save & Close to save the content or Close to quit the Add New Document form. Name The name of the web content. Language The language of the web content. At present, eXo Platform supports 23 languages. Main Content The main content that you want to display when publishing this web content. The Illustration tab allows you to upload an illustration that makes the site’s content more attractive. Illustration Image The path to an image which you want to upload into a site. This image will be used like an illustration of that site. Summary You can give a short description about the web content because it will be displayed with the illustration image when the web content is listed. The main content will be shown when it is selected to be viewed. Browse a list of images on your local device by clicking the Select File button, then select a specific location. Select an image in the list to upload. The Advanced tab includes two parts: CSS Data and JS Data. CSS Data Contains the CSS definition to present data in the web content. You can optionally enter CSS data into this field to specify the style. JS Data Contains the JS content to make the web content more dynamic after being published. You can optionally enter the JS content in this field. When you create new content which is in draft, a new activity will be created on your activity stream and on the Social Intranet homepage. 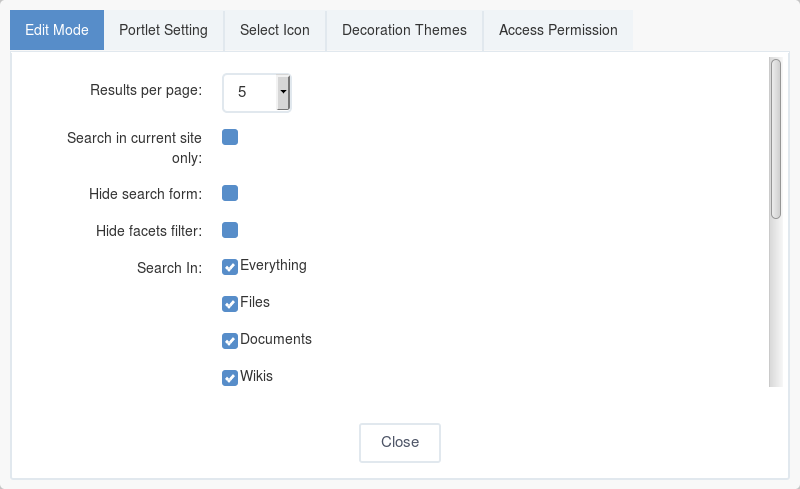 This activity shows the title , summary (if any), type , version and current status of the content, and the icon corresponding to the content type . Click to view the content in a larger window. Click to edit the content directly into the Sites Explorer. Click to give your idea. Click to show your liking to the uploaded document. When the content is deleted, the activity is also removed from the activity stream without any comment or notification. This function is used to edit web content in a specific drive of an existing site. Access the folder of a site which contains the web content that you want to edit. Select the web content by double-clicking it in the left tree or in the right pane. The detailed information of web content will be viewed in the right pane. Click on the Action bar to show the form to edit the selected web content. This form is similar to that of creating a new document. Make changes on current values in the fields of this form. Complete editing the selected web content by clicking Save or Save & Close. When you click , the web content will be auto-locked for your editing. After finishing, the content is back to the unlock status. You can manage “Locks” in the Unlocking a node section. This function helps you publish web content that you have added to the web contents folder in Sites Explorer. See the Publication process section to know how to publish web content. This function is used to remove web content from the web contents folder of a specific site’s drive. Right-click the name of the web content that you want to delete, then select Delete from the drop-down menu. Click Delete to accept your deletion in the confirmation message. This function enables you to add multiple languages for content. This action is similar to adding a language. Select a document to which you want to add the translation. For example, select a web content in English. Click on the Action bar to open the Add Translation form. Click Select Document to browse to the target content that has a different language with the first content. For example, the Web Content version in French. Click Save on the Add Translation form. Select the document to which you have added the translation, then click the button on the Filter bar. You will see the available languages for the selected document. Click the language on this pane to view the document in the corresponding language version. In eXo Platform, you can use WebDAV to perform actions on a website easily, quickly and efficiently without accessing it directly on web browsers. Each website managed by WebDAV will be displayed as a folder. You need to connect to your WebDAV clients. See WebDAV for more details. 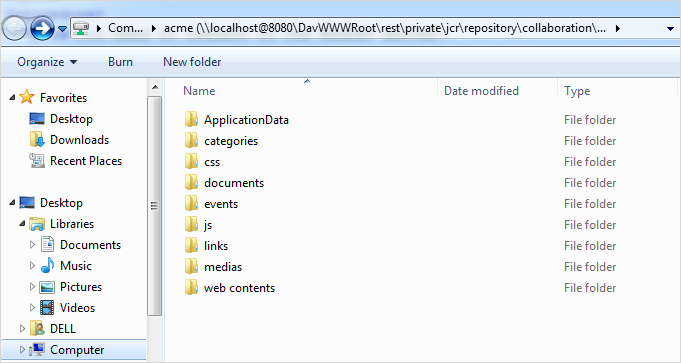 It is assumed that you want to access the ACME site using WebDAV, simply use the URL: http://mycompany.com:port/rest/private/jcr/repository/collaboration/sites/acme into the address bar. After successul login, the ACME site appears as a folder. This way can be done through Sites Management. Click on the top navigation bar, then select Content –> Sites Explorer from the drop-down menu. Click the Show Drives button, then select Sites Management. You will see all sites listed in the left sidebar. Right-click your desired site to view with WebDAV, and select Download and Allow Edition from the menu. The selected site will be shown in WebDAV. In this view, you can access documents in the directories that are linked to the web server. This function enables you to copy web content, such as an .html file, from your local device to a web content folder of a site. Access a site via WebDAV, then go to a web content folder of the site. Copy the web content on your local system into this folder. The copied file will be converted to web content that is viewable by WebDAV automatically. The content is converted to a directory containing CSS, documents, js and media. After the new content is added, it can be viewed as a folder in WebDAV or as a page using a web browser. This function enables site administrators to delete web content files separately or in batches. Navigate to the folder that contains the content you want to remove. Right-click the content files or directories (hold the Ctrl key to select multiple files at once), and select Delete from the drop-down menu. The selected files will be removed from the site. The Fast Content Creator portlet in PRODUCT enables you to quickly create and save a new document with only one template in a specific location without accessing Sites Explorer. This helps you save a lot of time when creating a new document. To use the Fast Content Creator portlet, you need to add it to a specific page first by dragging and dropping the Fast Content Creator portlet from Page Editor –> Applications –> Forms to the main pane. This can be done when creating a new page or editing an existing page or editing the layout of a site. Hover your cursor over the portlet, then click to edit the portlet. Location to Save Selects the location to save documents or messages. Select Template Selects a template for the document. There are different input fields corresponding to each selected template. Custom Save Button Changes the label for the “Save” button. Custom Save Message Changes the content of custom message that informs you have just saved a document. Redirect Allows you to redirect the path in the Redirect Path field. Redirect Path Shows a path to which you will be directed after clicking OK in the confirmation message. The Action pane Adds an action to the document and view actions added to the document. Select a specific location to save documents. i. Click next to the Location to Save field to open the Select Location form. in the Add column to select the child node in the right pane. After being selected, this location will be displayed on the Location to Save field. Created documents will be saved in this location. Select a template which is used to create a new document. Change the label for the Custom Save button, and the content for Custom Save Message. Tick the Redirect checkbox if you want to redirect to the path in the Redirect Path field after clicking OK in the confirmation message. Add an action to the document by clicking Add to open the Add Action form. Do the same steps in the Adding an action section. Click Close to quit the form to edit the configuration of Fast Content Creator. Click to save all your changes. The fast content creator portlet will be shown and allows you to create content quickly. Here is the added page containing a fast content creator for the Accessible Media template. Go to the page which has the fast content creator portlet. Fill values in all the fields in the page. Click a button in the page to accept creating the new document. A message appears to let you know that the document is created successfully at the location selected in the Location to Save field. The button name is different, basing on the Custom Save Button field. Select the drive and the path that you established in the configuration of Fast Content Creator. You will see this document. The category navigation gets rid of long URLs when you view content and enables you to see published documents or web content in specific categories in one page. Thanks to the symbolic link, no matter where the object physically resides, the database can retrieve it. In addition, the relations amongst shortcuts can be managed. Now, you can view documents or web content in the Content List Viewer easily. The left pane lists all the categories containing documents or web content. The right pane displays the documents selected in the left pane. Select a category that you want to view on the left. The selected category will be shown on the right (only documents or web content published are shown). Open News page on the Navigation bar. Click Edit –> Page Layout on the top navigation bar. The page which allows you to edit the Content List portlet will appear. Click to open a form with the Edit Mode tab, allowing you to edit the portlet. 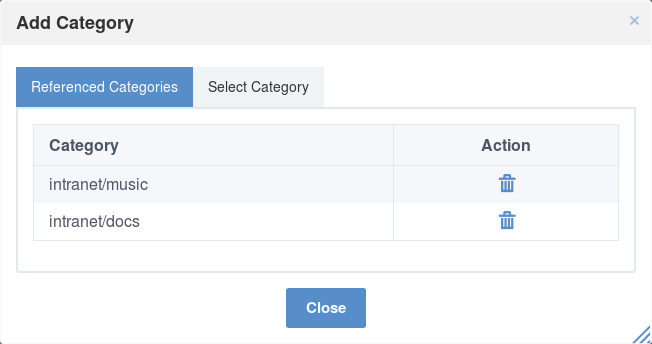 Click to select the path of a category which restores content you want do display. 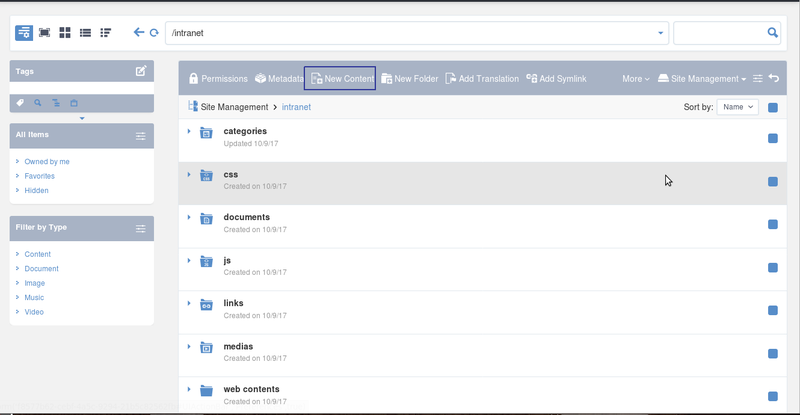 The Folder Browser form is displayed. Click a folder on the left pane and select its sub-folder. Edit some fields in the Display Settings tab as you want. See more details in the Content List Preferences section. Select the Advanced tab to set up some properties for the portlet. See more details here. Click Save to accept saving the configuration for the Category Navigation portlet. 9. Click on the Page Editor form to finish editing the Content List portlet. In the Edit Mode tab, some options are disabled. SEO (Search Engine Optimization) allows you to improve the visibility of your web pages and web content in the major search engines (such as Google, Yahoo, Ask, Bing, and more) via the search results. Therefore, it is very important for the user to maximize their web pages and content’s position in the search engines. 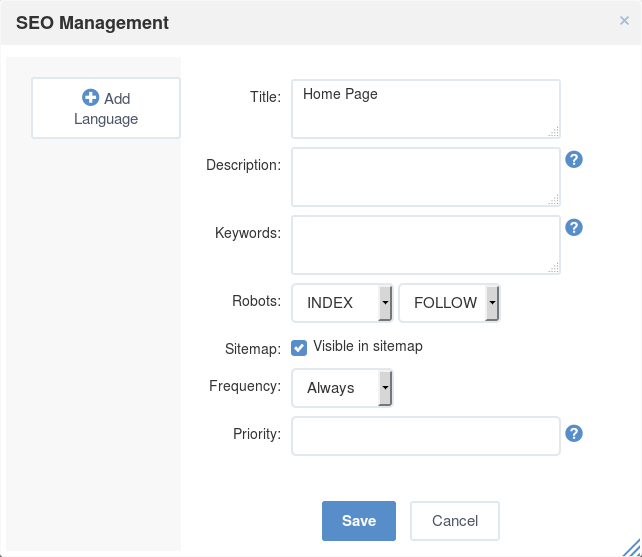 In eXo Platform, the SEO Management feature is provided to meet this target. By using SEO Management, you can easily manage the SEO data of web pages and web content. Open a page or content that you want to edit the SEO metadata. 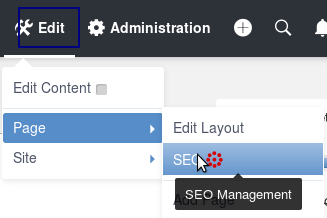 Open the SEO Management form by clicking Edit –> Page –> SEO on the top navigation bar. Depending on your SEO management for a page or content, the content of the SEO Management form will be different. Title The title of the current page. When changed, the new title will be updated to the <title> tag of the head element of the page. The Title element of your web page is very important, it should ideally optimize the SEO with a small number of keywords or key phrases. Description The description of your page/content. This description will be seen in the results list of search engines. Keywords The most important terms to describe the page, separated by commas. By using proper keywords, other users can find out your page/content via search engines more easily. Sitemap Allows you to see pages of the sites in the tree-like structure. Frequency Shows how often pages are updated on the site. Also, setting your frequency levels tells the search engines which pages should be crawled over other pages. The frequency levels include: Always, Hourly, Daily, Weekly, Monthly, Yearly and Never. If you set “Never” for the frequency level, meaning that this page never gets updated, so search engines will move onto other pages that get updated more frequently. Priority Allows search engines to search the page with the higher priority level first. The acceptable value in this field is from 0 to 1. In which, 0 is the lowest priority level and 1 is the highest. 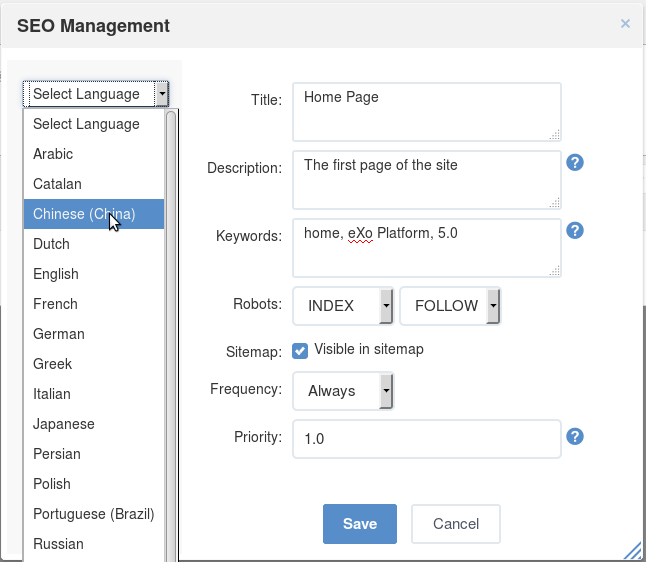 Allows you to add the localization for SEO metadata. You can choose the language from the drop-down list. Allows you to remove the SEO metadata for a respective language. Gives the meaning or requirement of each field. Fill out all fields in this form. Click Save to finish creating SEO metadata. If no language has been selected, the default portal language will be used after saving. means that the SEO information is empty. means that the SEO information has been updated but some information are not filled out yet. means that the SEO Management form is filled out with the full SEO information. means that the SEO Management feature is disabled. Instructions on how to search for content from the front page of a website. Instructions on how to change the display of search results. The Search function allows you to quickly search for any content in the system with a keyword from the front page, even if you do not log in. However, the number of the search results displayed depends on your role. For example, if you do not log in, you only see the search results that are published. Enter a keyword into the search box and press Enter. In the Search form, you can enter another keyword and set the search scale. Press Enter, or click Search to start searching. Editing the Search portlet allows you to change the display of search results. Open the Search page as in the Searching for content section. Click Edit –> Content on the top navigation bar, then click . Click Edit –> Page –> Layout on the top navigation bar. 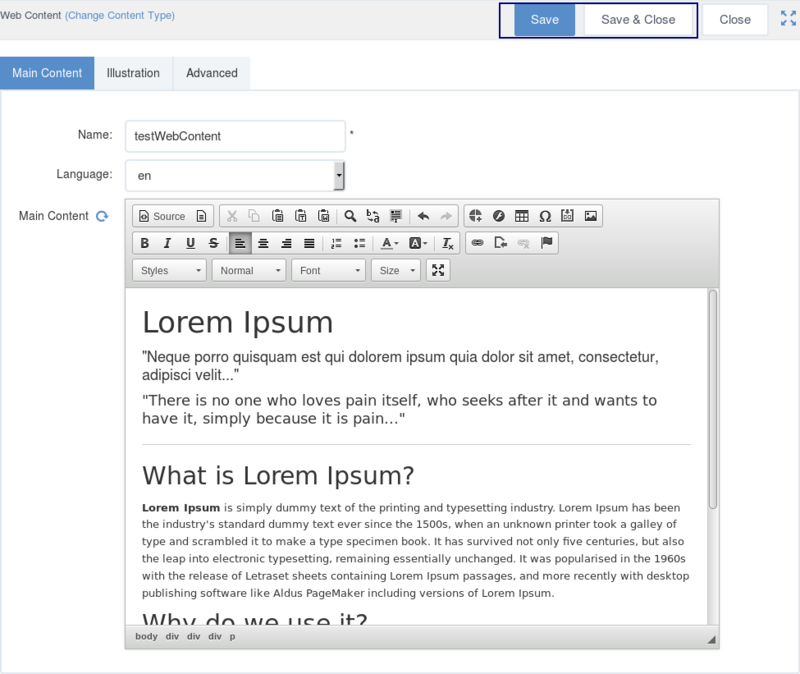 The Page Editor will be displayed. The Edit Mode of the Search portlet appears. Items per Page The number of search results displayed in each page. None: Only the first page of search results is displayed in the search page. More: When you click the Search button, the first page of search result is displayed. The difference from the None mode is that, there is a More button allowing you to see more search results. When clicking this button, new search results are appended to the current search result page like Twitter or Facebook behavior. Pagination: In this mode, the search results are divided into many pages (for example, 1, 2, 3 and Next). You can navigate to another page by clicking the page number or Next in the bottom of the Search portlet to view more results. Search Form Template The template of the Search form. Search Result Template The template for displaying the search results. Search Page Layout Template The layout of the Search portlet. Base Path The page where you can see the content of a search result. Edit your desired portlet and click Save to accept your changes. Click the name of the content which you want to print to view all the content. Click the Print button. The Print Preview page will be displayed on another tab. Click Print to print the content of this page, or Close to close this tab without printing.